OK guys, this series of articles has been a long time coming, but I'm finally biting the bullet and putting the words down. The purpose of this is to try and encourage wushu enthusiasts out there to start wushu clubs at their colleges and universities. I've been one of the main organizers in collegiate wushu for the past several years so this is something near and dear to my heart. Hopefully this article and the subsequent ones in the series will give people the motivation and information needed to start up a club. Let me start off with a not so brief history lesson. This is by no means the "correct" version of wushu collegiate history, just the history as best as I know it. [If anyone has more info or corrections, please let me know]. As far as wushu in college goes, the biggest, baddest, oldest kid on the block (that's still around at least) is the UC Berkeley Wushu Club (aka "Cal Wushu"). Berkeley has the largest Martial Arts Program in America, with over 1000 participants in 6 different martial arts disciplines. Our Taekwondo team has been collegiate champion for like 9 out of the past 10 years or something like that. Wushu was added in the early 80's by Anthony Chan (who was one of the first Americans to go to China to train in wushu and went on to start the chain of America's Best TKD schools). At this point contemporary wushu was practically unknown in the US, practiced by only a handful of athletes, so the Berkeley club struggled. With Anthony Chan's graduation, the club was inactive until it was revived in the early 90's, with Bryant Fong as the coach. Even by the 90's wushu was still relatively small in the US, although other schools had kungfu or taiji clubs, and UCLA had even had a contemporary wushu club too during the 80s (taught by Eric Chen). By the time I started training there in 1993, Berkeley's club was still small, with less than 30 students. 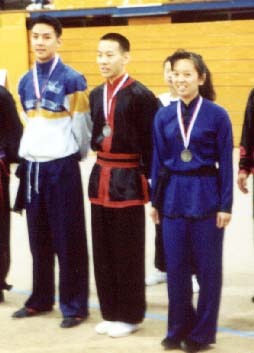 From left to right, thats Daniel Wu, founder of the Oregon Wushu Team, and Patrick Lee and Frances Lau, members of the Cal Wushu Team at the UC Berkeley Chinese Martial Arts Championship in April of '94. By now wushu was getting more popular in the San Francisco Bay Area. By this time Zhang Hong Mei and Hao Zhi Hua, former Beijing Wushu Team members had opened private wushu schools in the area in addition to the San Francisco Wushu Team, who had been working out in SF's Chinatown for several years. In 1992, one local wushu student by the name of Dan Wu, ended up going to the University of Oregon for college, he was frustrated with only being able to practice wushu when he was home on vacation. His solution was to found his own wushu club at U of O, which he did in 1994. He was unable to find a qualified coach in the area to teach, so he became the coach too. Through much hard work and some luck, Dan Wu was able to find more students who became as passionate about wushu as he was and ultimately to take over the reins of the club when he graduated. Now, seven years later, the University of Oregon club has survived and prospered (thanks to the efforts of the subsequent student-coaches, including Brandon Sugiyama and Luke Harrington). And in case you were wondering, Dan Wu (or Daniel Wu as he's now known) has gone on to become a movie star in Hong Kong, featured in such movies as Gen-X Cops, Young & Dangerous V, Purple Storm, and Bishnonen. 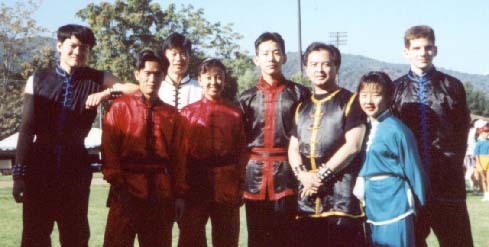 By the mid 90s, Cal Wushu had grown quite large, to almost 100 members, mostly as a result of the successful hosting of the Beijing Wushu Team in 1995. In addition to Oregon and Berkeley, UCLA once again had a vibrant club, all of whom started participating in Berkeley's annual Chinese Martial Arts Championship. In the summer of 1996, some of us from Berkeley (myself and Mae Hsu), Oregon (Brandon Sugiyama) and UCLA (recent Cal Graduate, UCLA grad student Felicia Sze) finally decided to sit down and discuss an idea we had been kicking around - forming a genuine Intercollegiate Wushu Competition. Featuring only college students and, like China, having a real team competition. We tried very hard to make a balanced, inclusive competition for not only contemporary wushu, but also internal and traditional wushu. (See the other sections for more on this subject). The first true meeting of the collegiate teams at the '96 UC Berkeley Tournament. U of Oregon is on the left (in green and yellow), UCLA (in the blue and white) approximately in the center and UC Berkeley (in the Blue and Gold jackets mostly) on the right. 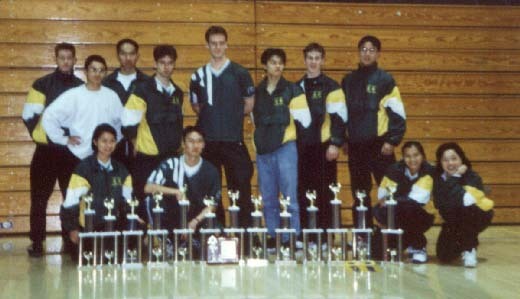 The first collegiates was hosted by Oregon the following February, 1997 organized by Brandon Sugiyama and the U of O club. Four teams participated, Oregon, UCLA, and two teams from UC Berkeley. One made up of current Cal Wushu members, and a second made up of Cal students who trained at private wushu schools. The competition was a big success, UCLA's team took home the coveted team championship, UCLA's Felicia Sze took the Women's All-Around and Eric Yeh of Berkeley's Golden Bear team took the Men's All Around. As far as we are aware, this was the first US competition to feature a team competition. Many subsequent tournaments have tried to add their own versions, but none have done a very good job. Competitors line up for the first collegiates in February '97. From left to right the lines are - Golden Bear Wushu Team from UC Berkeley, Erick Louie and Anne Hsu, representing Arizona State and Stanford respectively, the hosting Oregon Wushu Team (lead by tournament director Brandon Sugiyama), the UCLA Wushu Team, and finally the Cal Wushu Team. The following year after UCLA flaked on hosting the second year's competition with only a few months notice (sorry, no nice way to say it! ), I had to (almost single handedly) organize the 1998 collegiates at Berkeley. Thankfully with the help of the UC Martial Arts Program, collegiate wushu didn't die in its critical second year. The team competition was won by the Golden Bear Team (again, a group of Cal Students who trained off-campus), Mae Hsu took the Women's All-Around, and Oregon's Luke Harrington took the Men's All-Around. The tournament also featured a demo and judging by the Beijing Wushu Team. UC Irvine, who formed a club in 1996, hosted the 1999 Collegiates. This event marked a dramatic increase in the size of the collegiates. For the first time full teams were fielded from schools like UCI, Cal State Fullerton, and the newly ressurected Stanford Wushu club. Despite a good deal of controversy over the eligibility of one of the teams, the competition was a big success, One of Cal Wushu's two teams (now unified under new coach, Li Jing) took the team championship, and Berkeley's Mae Hsu and Nathan Tong took the All-Arounds in their senior year. The fourth year brought collegiates back to the Bay Area, this time hosted by the still young Stanford Wushu Club. It was actually the biggest collegiates to date, but due to more restrictive eligibility rules enacted to prevent the problems of the year before, only Cal and Stanford were able to field teams. But as these are two of the largest Wushu clubs out there, they were able to field 6 teams (four from Berkeley and two from Stanford). Berkeley took first in the team competition with Stanford's Janet Hsu taking women's All-Around and Cal Tech's Justin Ho taking Men's. Another milestone was the participation of a group from the University of Wisconson, marking the first time a non-west coast wushu club has participated. 2001 collegiates is set to be hosted by Cal State Fullerton, and of course we're hoping to see everyone return for that one. Every year the collegiates is growing, even as we hit speed bumps and make refinements. Hopefully this event will grow to include more midwest and eastern schools in the future. The University of Oregon poses with the large number of trophies they just won after the '97 UC Berkeley Tournament.